Client News: Apogee's Building Retrofit team publishes "Window replacement: Unrealized benefits to building owners"
Most U.S. buildings currently in use will continue to be until 2050 and, eventually, will require renovation. Helping building and property managers evaluate and maximize the benefits of window system renovation and upgrades, Apogee Enterprises, Inc.'s Building Retrofit Strategy Team offers a new 28-page publication. "Window replacement: Unrealized benefits to building owners" is available free for download at http://www.apog.com/documents/ApogeeRetro_WhtP.pdf. "Replacing aging windows with new, high-performance systems provides a better environment for the building's occupants and greater value for the building owner," said John Bendt, vice president of Apogee's Building Retrofit Strategy Team. "Window systems and components have evolved significantly since the 1980s," explained Kevin Robbins, Apogee's Building Retrofit Strategy Team account manager. "About half of all U.S. commercial and institutional buildings were constructed prior to this period, which presents a significant opportunity for owners and occupants to benefit from façade improvements and window replacement." Bendt continued, "Among the many benefits, modern window systems improve the appearance and performance of aging buildings. New, high-performance glass and aluminum frames with thermal barriers help save energy, reduce maintenance, lower vacancy rates, increase rental rates, provide a better environment for the building's occupants and creates greater value for the building owner and enhance occupants' satisfaction and comfort." The paper's nine featured projects range from the 1800s to the 1970s with geographies from Boston to Portland, Oregon. As many of these examples demonstrate, re-cladding and renovating building exteriors with high-performance window systems can have a significant effect on the building's energy efficiency. To compare performance data between a building's existing windows and proposed, new, high-performance, replacements units, Apogee's Retrofit Strategy Team offers free energy modeling that provides building performance information on annual energy, peak demand, carbon emissions, daylight, glare, and condensation. "Looking beyond simple energy payback, today's owners and facility managers consider all the factors involved, including carbon footprint reduction, maintenance savings, and safety and occupant productivity," added Robbins. When window replacement is timed in conjunction with an HVAC system upgrade, significant reductions in peak load can yield further savings in equipment costs. For building owners seeking enhancements in security, design criteria for façade renovation also can include blast hazard mitigation, hurricane impact resistance, electronic eavesdropping protection and forced entry deterrence. "Establishing clear goals, priorities and expectations for building envelope maintenance and renovation will significantly contribute to future success. Working with an experienced building envelope retrofit team that includes the installer and manufacturers, building owners and facility managers will optimize the intended benefits and return on investment," concluded Bendt. 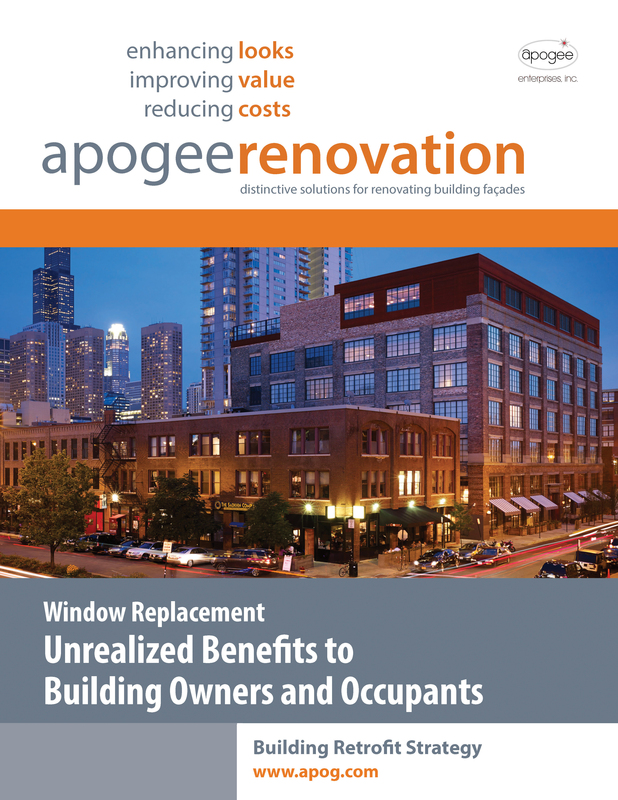 To learn more about Apogee's Building Retrofit Strategy Team's services, or for a copy of "Window replacement: Unrealized benefits to building owners," please visit http://www.apog.com/renovation.html or contact John Bendt at jbendt@apog.com, 612-790-3137; or Kevin Robbins at krobbins@apog.com, 715-409-0821. Apogee's business units that supporting these building retrofit strategies include Alumicor; Harmon, Inc.; Linetec; Sotawall Inc.; Tubelite Inc.; Viracon, Inc.; and Wausau Window and Wall Systems.